As many of you are probably aware,an email was sent to over 6000 students and staff of Winston-Salem State University toting the Democratic slate and urging people to get out and vote. The message was recanted but the potential damage has already been done, particularly since WSSU has been designated as an early voting site. Winston Salem State University has a formal complaint lodged against it for using OUR tax dollars to promote the Democrat Party this week. Let me repeat, they are using our tax dollars to advocate for 1 party only. So this is what we are up against and it is morally reprehensible and absolutely illegal. Someone should be held accountable for using university funded email servers to promote their political beliefs. So what is our call to action? Each and every one of us needs to call the Chancellor’s office, Donald J. Reaves, and let him know that this is illegal and an investigation must take place and the person who is responsible must be dealt with legally to ensure that this type of activity is never allowed to occur again. This should NOT stand, after all this is OUR money they are using. Voting is convenient and critical. To volunteer at the polls to distribute the official Democratic Party Candidate Listing, visit our website at www.forsythdemocrats.org <https://wmail.wssu.edu/exchweb/bin/redir.asp?URL=http://www.forsythdemocrats.org/> . We need you to make sure all candidates are fairly represented and supported! Thursday & Friday October 14 – 15………………8:00 a.m. – 5:00 p.m.
Monday – Friday October 18 – 22………………8:00 a.m. – 5:00 p.m.
Sunday October 24…………………….1:00 p.m. – 5:00 p.m.
Monday – Friday October 25 – 29………………8:00 a.m. – 5:00 p.m.
Saturday October 30..………………….10:00 a.m. – 1:00 p.m.
Satellite locations for early voting will open on October 25 at Carver School Library, Kernersville Senior Center/Library, Lewisville Library, Polo Park Recreation Center, Rural Hall Library, Southside Library and WSSU Anderson Center. Monday – Wednesday October 25 – 27………………10:00 a.m. – 7:00 p.m.
Thursday – Friday October 28 – 29………………10:00 a.m. – 5:00 p.m.
Saturday October 30..…………………..10:00 a.m. – 1:00 p.m.
Also, we have two newly announced evens to promote. Please join us! This event is an opportunity for you to speak directly with the candidates before you vote. Some 6,400 staffers and students at Winston-Salem State University received e-mail exhortations Monday to take advantage of early voting and help the Democratic Party, setting off local Republicans. After a complaint by Nathan Tabor, the chairman of the Forsyth County GOP, university officials acknowledged that the e-mail — sent from the student-affairs division — was improper. The university cited a state law that prohibits the use of a state employee’s authority or state property to support or oppose a person or an issue in any election. That wasn’t the end of it, though. Yesterday, the university sent out what Tabor called an “equal time” e-mail inviting all the same recipients to work for Republicans during early voting. That message was to be retracted by the university last night once it had been out six hours — the same amount of time the Democrat message was out before being retracted. Tabor said he’s upset that he had to call the university and complain. The university said it would try to discover who sent out the e-mail and whether it was sent intentionally or accidentally in a partisan form. Early voting started last Thursday in Forsyth County and runs through Oct. 30. Election Day is Nov. 2. About 2,200 people had voted in the county by mid-day yesterday since the start of early voting. Slightly more than half the voters were Democrats, with Republicans making up 36 percent and unaffiliated voters making up another 15 percent, a board of elections official said. Journal reporter Paul Garber contributed to this story. Rob, good morning. Hope you are well. I would like to lodge a formal complaint against Winston-Salem State University for using tax dollars to promote the Democrat Party and then not disclosing this offense until I called the Chancellor’s office. WSSU has proven themselves to not respect and uphold the law. This disqualifies them from being a suitable place for early voting. There is already major distrust with voters. Please remove another reason for the voters to distrust the system even more. The email sent out by WSSU also promotes an event called Souls at the Polls. What is the connection between Linda Sutton and WSSU? There could be nothing, which I hope, and there could be more which would be unethical. I respectfully ask that an emergency hearing be held and WSSU’s early voting be suspended for Election year 2010 and years to come. Using tax dollars to support a political party is illegal. Period. Please let me know the boards thoughts asap. Thanks! The Rev. 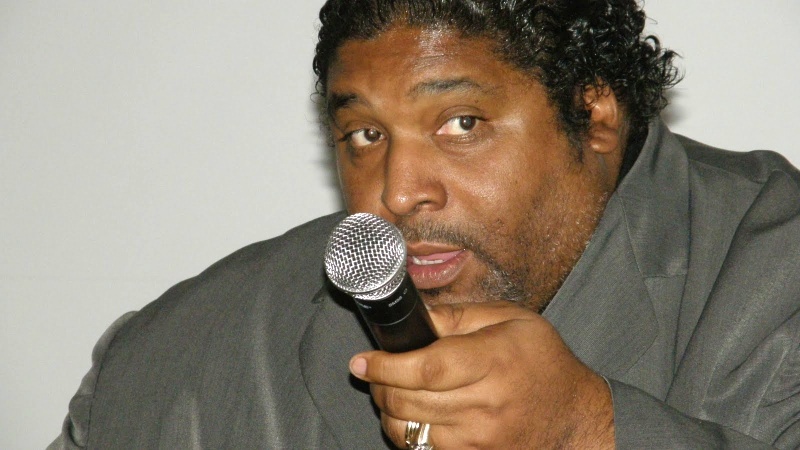 William Barber II, president of the NC NAACP, leads the assembly at Green Street United Methodist Church in the singing of the Civil Rights Movement anthem, “Ain’t Gonna Let Nobody Turn Me Around,” during an education forum sponsored by the Institute for Dismantling Racism in Winston-Salem on Monday night. The struggles of the Civil Rights Movement served as a backdrop for the education forum hosted by Green Street United Methodist Church in Winston-Salem Monday night. Barber frequently touched on the Civil Rights struggle of the 1960s as he spoke of the actions of a coalition of citizens and clergy who oppose the Wake County Board of Education’s decision to change its student assignment policy, which is based on socioeconomic diversity. Wake County is the largest school system in the nation to base student assignment on family income. Last fall, Wake County voters elected four Republicans to the school board, and one of the first things the new Republican majority attempted to implement was a neighborhood schools program, which would “tear asunder” the socioeconomic diversity system, Barber said. The logic of the Republican members of the Wake County school board appears to be, “If it’s working, break it,” Barber added. Barber was one of 19 people arrested at a school board meeting in July for protesting the board’s actions in a show of civil disobedience. Barber said what’s happening in Wake County is not a local issue or even a statewide issue, but a national issue. Willard Bass, executive director of the Institute for Dismantling Racism, agreed with Barber’s assessment. Bass said Wake County isn’t the only school system struggling with this issue. The Winston-Salem/Forsyth County Schools have had a problem with the re-segregation of its schools since the board of education implemented a school choice plan in 1997. Barber went on to say that the “noble goals” of Wake County’s policy of socioeconomic diversity — which have led to outstanding student achievement and national acclaim — are in great peril. The school system’s income-based student assignment policy, which began in 2000, ensures that no school has more than 40 percent of its students receiving free and reduced lunch, and no more than 25 percent of its students failing to perform at grade level. Dulaney, who served as the assistant superintendent for growth and planning, helped the county pass a $1 billion school bond referendum in 2006 to accommodate the massive rate of growth in the system. The current controversy over student assignment, busing and socioeconomic diversity boils down to three basic facts, Dulaney said. A school system can’t achieve academic success for minority students by assigning them to schools where they are the overwhelming majority; when schools are more ethnically and economically diverse, students excel; and when new schools and old schools have similar mixes of students, it keeps the middle class invested in all schools, which leads to greater parental involvement and higher test scores, Dulaney said. The key to sustaining economically diverse schools for the past decade has been the rapid growth of magnet schools in Wake County because when all schools are essentially alike, and some of the best schools are in economically depressed areas, it inhibits the desire for a neighborhood school assignment plan, Dulaney said. Tyson pointed out that the NAACP has been fighting for excellence and equity in North Carolina public schools since the 1940s, and the organization’s leaders have paid a heavy price, especially when schools were desegregated in the late 1960s and early 1970s. NC Rep. Earline Parmon said she hopes members of the Winston-Salem/Forsyth County Board of Education get the message that when you have equality and diversity in schools, all students excel. She recalled growing up as an African American in Winston-Salem and attending segregated schools, where she encountered grave injustices faced by all minority students before integration. The only debate in the 5th District Congressional race took place Tuesday night between the Republican incumbent Virginia Foxx and Democrat Billy Kennedy. Hosted by the Charlotte TEA Party. Where: Cornerstone Event Center 315 Webb Road. Dress will be casual, though the candidates will probably be in business suits. Please, NO SIGNS, since we will be inside. There is no admission, but we will have our donation box there, as we do need financial help for this event. Funds will be needed for a number of purposes including newspaper advertising, some guest expenses, the Event Center Rally and decorations. If you are so led [to donate], and we pray you are, please mark your checks for the “Rally” and make checks out to Darlene Blount mail to 212 Ferncliff Drive, Salisbury, N.C.28147. It has been the position of most tea party groups, including this one, to not endorse specific candidates. Rather, we have tried to highlight candidates that support the principles of limited government, individual responsibility, and free market polices. Now, a group has wrapped all of those principles into a document that lays out a plan for how both the NC General Assembly and the citizenry can work together to solving our problems. It is called the Carolina Compact. For the government, the Carolina Compact lays out a specific plan that controls the budget, improves education, protects property rights, and brings transparency to the state government. It is not a listing a principles, but a specific list of items and policies that need to be enacted to return the power to the people, and make NC the leading state in the union. Candidates are encouraged to sign the Compact and pledge to bring these items to the floor for debate and passage. At the same time, the Carolina Compact asks citizens to use this returned power to ensure those who legitimately need help get it. It is not a list of items that government will force us to do, rather it is five actions that we can take in our everyday lives to better our communities and our state. Many of these things are already parts of our lives: giving to charity, saving for a rainy day, and volunteering time. After reading the Carolina Compact, you should consider signing as a citizen, and then ask your local representative to take a look at it and sign as well. By working together, we can promote this plan of conservative ideals, and demand that our state representatives implement it when they get to Raleigh next year. For more information, and to sign, visit the Carolina Compact. There’s going to be a TEA Party in Greensboro tomorrow, October 14th to celebrate the beginning of early voting. It will be at 5:30pm, in downtown Greensboro, in the plaza between City Hall, the Courthouse, and County Office Building. (Same place April 15 Tea Party rally was held.) Candidates will be present, you can send your questions to c4guilfordco@gmail.com and your question(s) might be asked on stage! (Be sure to note who your questions are directed to when you send them in). Event hosted by Conservatives 4 Guilford County. From their website: New Left Media is Chase Whiteside, Erick Stoll, and a camera. We are currently students at Wright State University in Dayton, Ohio. They are featured on Tea Party Tracker, the website that claims keeps a “watchful eye” on us crazy, insane and racist Tea Partiers. If you look at the bottom of the website you will see the logo for the NAACP, Think Progress, and Media Matters. But below that you will see the tag “© 2010 National Association for the Advancement of Colored People” Therefore it would appear the NAACP is the owner of this Tea Party Tracker website. 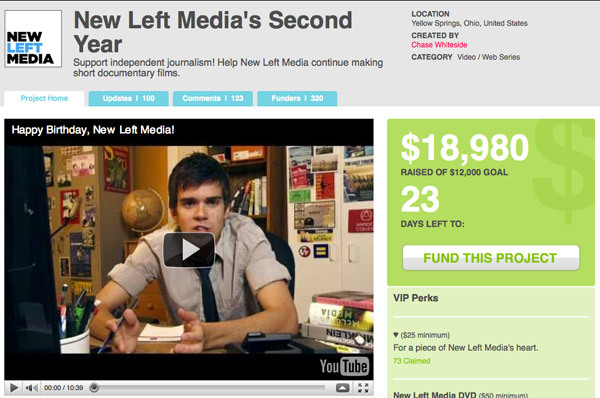 New Left Media has raised $18,980 for their $12,000 fund raising campaign as seen here. Not bad for a group that has been around for 1 year and has 14,367 followers on Facebook. So how is Soros connected? He helped launch (or rather funded, unless he is doing web programming on the side) Tea Party Tracker. Therefore the NAACP is in the same boat with all these organizations and George Soros. Isn’t it interesting. And these people and now these 2 kids are well funded. The NC Tea Party has found out from a credible source that the republican “leadership” has told old and new candidates in North Carolina not to talk too much about higher taxes because if the GOP wins the house and senate they will bring about legislation to Tax Services in NC to close the budget gap, instead of cutting spending. If this is the case why do we want these bums in office? Would they be any different than the Democrats? From this little bit of information we have found out, in fact they are just a different group of tax and spend. This is why we need new blood in the NC Legislature. So this is our WARNING to each and every single republican candidate that wants to increase our taxes in North Carolina. We will watch you and call you out with more action and fever than we did with the Democrats. You can NOT co-opt the Tea Party, we have allegiance to no political party. Any Republican that authors, sponsors or votes for this tax on services WILL be primaried in 2 years… if you think we are mad at the Democrats just try this and every single one of you will be on monster.com after the next election. You have been warned – The NC Tea Party. We’ve gotten a lot of feedback in recent days in person and by email concerning the upcoming election and which candidates are “tea party backed”. There are some misperceptions I believe happening in the media that need to be straightened out. The tea party is a movement, not a political party. The tea party, not being a political party, cannot “put forth” candidates to be on the ballot. When the media says “tea party backed”, it is not necessarily talking about a specifically designated group, or party, but, people in a certain area that identify themselves as “tea party” people, outwardly supporting a candidate. Therefore, it does not matter if a tea party group is making a lot of noise for a candidate, if a candidate is supportive of these values, this is a candidate in which a person who identifies with the tea party movement, will want to vote for. When the Tea Party Express got involved in Delaware, it was in a primary where the GOP was outwardly favoring a less than favorable candidate than the one who best stood for the tea party values as stated above. The North Carolina primary was in May. At this point in North Carolina, the tea party people, that’s you- can show your strength by getting involved with LOCAL campaigns, that is, on the state and county level, and help the candidates who will serve you on the state and county level, get elected. THEY need your help. Lets not get swept away with the emotion that is all over the TV on the national level that we let what truly matters in THIS state most, that we get a conservative majority in Raleigh this November for the FIRST time in 100 years. As we stated in earlier posts, NC TEA Party is not endorsing candidates, we are asking the citizens of North Carolina to endorse their candidates. It’s the citizens of this state that represent the NC TEA Party pulse, not the people behind this website and organization. We’ve been under fire via email for not providing lists for people to be able to look up candidates in their area. North Carolina has 100 counties. That means there’s a minimum of 100 school boards, the NC House is represented by 120 members, and the NC Senate is represented by 50 members. Why should the responsibility of vetting candidates for each district be put upon the tea party’s shoulders? Not just us, but ANY tea party? Are we still in a political environment where you vote for someone because someone else told you to vote for them, and not because you know for a fact you believe that person is the best person for the job? If we are advocating for individual responsibility, we must be the first to exhibit that trait, and be responsible for our own votes. This year, conservatives need not only to be able to say WHO they are voting for, but WHY they are voting for that person, AND- encouraging minimally FIVE other people to do the same thing. As of right now, our endorsement post has 11 responses. Election day is LESS than a month away. This is a conversation that MUST be had with each other- WHO we are voting for, and WHY? We need to be EXCITED about our candidates. I’m excited about mine! The more engaged I have been with my candidate of choice’s campaign, I’ve come to the conclusion if he was any brighter he’d blind us all. As far as I’m concerned, we need 170 of him in Raleigh. Even my Democrat family members are voting for him this year! We ALL need to be excited about our candidates. If you are in a district that your House and/or Senate Representative is not being challenged, find the next one nearest to you, and DONATE to their campaign. Get involved. Make calls from your home. Do SOMETHING. It is in YOUR best interest that THEY get elected, too. A rising tide lifts ALL ships. As for lists, here is how you find who is running in your area: Go to the State Board of Elections website here, enter your information, click on SAMPLE BALLOT, and those are the people who are running to represent YOU this fall. From there, google their names and positions they are running for, and learn more about them. DONATE to their campaign, it’s NOT too late. There are non-conservative incumbents who have hundreds of thousands of dollars in their battle chest ready and waiting to spend it. Our state candidates have already made a GREAT sacrifice in running to begin with- we OWE it to them to give what we can to help them make it to the finish line with 51%+ the evening of November 2nd. As for school boards, the school board (and judicial) races are non partisan this year. Find out who the conservatives are on the ballot, and from there do your research. Do NOT skip over this part of the ballot! Even if you do not have children, it is up to conservatives to make sure our school children are being given the proper opportunities to learn in the best way possible, including school choice, which is at stake in some counties this year. The judicial races are equally important! Once you find who you are voting for, come back and join the conversation. Share who your choices are for all the races. There might be others in your area who are looking for people to support!